Antenatal stimulation of lung growth is a reasonable approach to treat congenital diaphragmatic hernia (CDH), a disease characterized by pulmonary hypoplasia and hypertension. Several evidences from the literature demonstrated a possible involvement of renin-angiotensin system (RAS) during fetal lung development. Thus, the expression pattern of renin, angiotensin-converting enzyme, angiotensinogen, type 1 (AT1) and type 2 (AT2) receptors of angiotensin II (ANGII) was assessed by immunohistochemistry throughout gestation, whereas the function of RAS in the fetal lung was evaluated using fetal rat lung explants. These were morphometrically analyzed and intracellular pathway alterations assessed by Western blot. In nitrofen-induced CDH model, pregnant rats were treated with saline or PD-123319. In pups, lung growth, protein/DNA ratio, radial saccular count, epithelial differentiation and lung maturation, vascular morphometry, right ventricular hypertrophy and overload molecular markers, gasometry and survival time were evaluated. Results demonstrated that all RAS components were constitutively expressed in the lung during gestation and that ANGII had a stimulatory effect on lung branching, mediated by AT1 receptor, through p44/42 and Akt phosphorylation. This stimulatory effect on lung growth was mimicked by AT2-antagonist (PD-123319) treatment. In vivo antenatal PD-123319 treatment increased lung growth, ameliorated indirect parameters of pulmonary hypertension, improved lung function and survival time in nonventilated CDH pups, without maternal or fetal deleterious effects. Therefore, this study demonstrated a local and physiologically active RAS during lung morphogenesis. Moreover, selective inhibition of AT2 receptor is presented as a putative antenatal therapy for CDH. Supplementary material is available for this article at 10.2119/molmed.2011.00210 and is accessible for authorized users. Congenital diaphragmatic hernia (CDH) is a severe developmental anomaly, with a mean incidence of 1:2,500 live births, in which etiology remains poorly understood (1,2). This congenital anomaly is characterized by a diaphragmatic defect that allows intrathoracic herniation of abdominal organs, and consequently, maldevelopment of the alveoli and pulmonary vessels. For many years, this malformation was thought to be a surgical emergence, solely related to a diaphragmatic defect, and potentially curable by surgical closure of this defect after birth, which allowed lung expansion. However, during 90 years, CDH pathophysiology progressed for a physiological emergence (3,4). It is now clear that lung hypoplasia and consecutive persistent pulmonary hypertension (PH) associated with this disorder are the key determinants of mortality (1, 2, 3, 4). Despite the improvements in understanding CDH pathophysiology and advances in neonatal care, such as the use of extra corporeal membrane oxygenation and inhaled nitric oxide, the mortality (50%) and morbidity rate in CDH newborns remains exceedingly high (1, 2, 3, 4). In humans, CDH can be accurately diagnosed at second trimester during routine ultrasound examination. Therefore it is amenable to antenatal therapies. Hence, antenatal therapies that promote fetal lung growth remain an appealing approach to improve survival of CDH fetuses. However, fetal surgical interventions, such as fetal tracheal occlusion, are invasive, technically demanding, limited by the maternal and fetal risks, and their efficacy is still not determined, with controversial results in survival and morbidity rates (5,6). Therefore, less invasive approaches such as antenatal pharmacological treatment to stimulate lung growth before birth and to treat PH are also under investigation (3,7, 8, 9, 10). The renin-angiotensin system (RAS) is a classical endocrine system regulating blood pressure, electrolyte and fluid homeostasis, involving several key components, namely angiotensinogen (the hepatic-derived precursor), two critical enzymes, renin (secreted from the juxtaglomerular apparatus of the kidney) and angiotensin-converting enzyme (ACE, pulmonary-bound metalloproteinase), whose sequential actions produce angiotensin I and the physiologically active, angiotensin II (ANGII), respectively (11). ANGII operates on two G proteincoupled receptors, the ANGII type 1 (AT1) and type 2 (AT2) receptors (11). During the last two decades, in addition to this classic endocrine system, evidence has demonstrated the presence of a local RAS with autocrine/paracrine actions in several developing organs, such as fetal kidney, heart, vasculature and adrenal development (12). Regarding lung morphogenesis, there is some evidence that lung expresses ACE as well as AT1 and AT2 receptors during fetal development (13, 14, 15). However, RAS components expression pattern, as well as effects during lung morphogenesis, is largely unknown. In this study, we assessed the expression pattern and function of RAS during fetal lung development. Moreover, we assessed the role of RAS as a putative target for treatment of fetal lung hypoplasia in CDH. Animal experiments were performed according to the Portuguese law for animal welfare (16; Diário da República, Portaria 1005/92). Animals were housed in an accredited mouse house and treated as specified by the recommendations of the Helsinki convention (17) and the Guide for the Care and Use of Laboratory Animals, published by the National Academy Press (18). In vitro studies were carried out to assess expression and function of RAS in fetal lung, whereas in vivo studies were performed to explore RAS as a target to treat fetal lung hypoplasia using the nitrofen-induced CDH rat model (19). Sprague Dawley female rats (225 g; Charles River; Barcelona, Spain) were maintained in appropriate cages under controlled conditions and fed with commercial solid food. The rats were mated and checked daily for vaginal plug. The day of plugging was defined as gestational d 0.5 for time-dating purposes. According to the nitrofen-induced CDH rat model (19), at 9.5 d postconception (dpc), randomly selected pregnant rats were exposed to 100 mg nitrofen (2,4-dichlorophenyl-p-nitrophenylether). At different time points, fetuses were harvested by cesarean section. After fetal decapitation, a toraco-laparotomy was performed under a binocular surgical microscope (Leica, Wild M651.MSD, Heerbrugg, Switzerland) to inspect the diaphragm and harvest the organs. Fetuses were assigned to three experimental groups: (i) Control group (C), fetuses not exposed to nitrofen; (ii) Nitrofen group (N), fetuses exposed to nitrofen without CDH; (iii) CDH group, fetuses exposed to nitrofen with CDH. 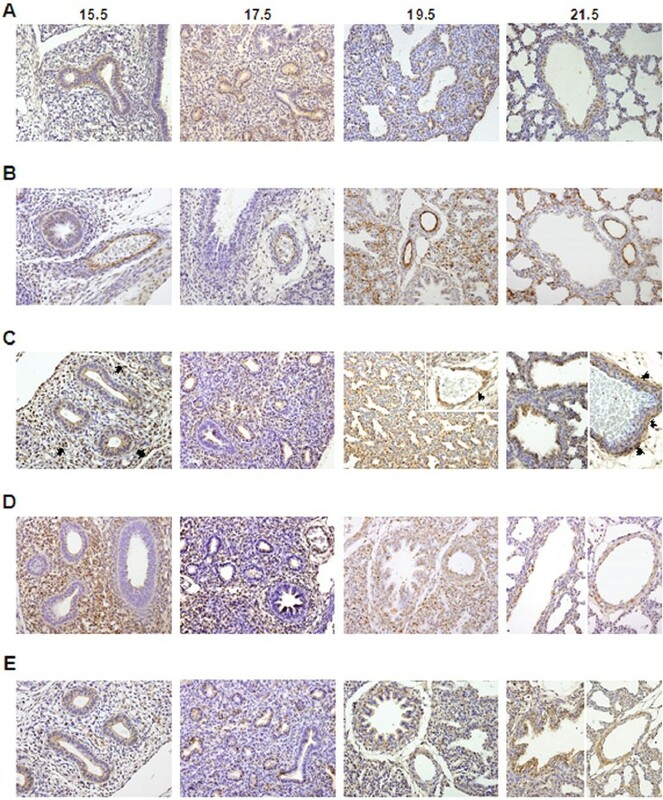 Normal fetuses removed by cesarean section at 13.5, 15.5, 17.5, 19.5 and 21.5 dpc were killed by decapitation, and lungs dissected and processed for immunohistochemistry (IHC). Lungs of fetuses with 13.5 dpc were also dissected to perform fetal lung explants cultures and posterior western blot analysis. IHC was performed on formalin-fixed and paraffin-embedded lungs, as previously described by Nogueira-Silva et al. (7). Renin antibody (sc-27320; Santa Cruz Biotechnology, Santa Cruz, CA, USA) was used in a 1:25 dilution, ACE antibody (sc-20791; Santa Cruz Biotechnology Inc.) in a 1:75 dilution, angiotensinogen antibody (Abbiotec LLC, San Diego, CA, USA) in a 1:100 dilution, AT1 receptor antibody (sc-1173; Santa Cruz Biotechnology Inc.) in a 1:50 dilution and AT2 receptor antibody (sc-9040; Santa Cruz Biotechnology Inc.) in a 1:25 dilution. Incubation with the Ultra Vision detection system anti-polyvalent horseradish peroxidase (Lab Vision Corporation, Fremont, CA, USA) or with the goat ImmunoCruz™ Staining System (Santa Cruz Biotechnology Inc.) was carried out according to the manufacturer’s instructions. Recombinant ANGII (Sigma, St Louis, MO, USA), AT1-antagonist (ZD-7155; Tocris Cookson, Bristol, UK) and AT2-antagonist (PD-123319; kindly supplied by Pfizer, Groton, CT, USA) were added daily to lung explants to achieve increasing concentrations of ANGII (from 10−9 to 10−4 mol/L) or ZD-7155 or PD-123319 at 10−5 mol/L. These doses were selected according to the literature (20,21). This set of experiments created the following groups: control (n = 30), ANGII 10−9 (n = 10), ANGII 10−8 (n = 11), ANGII 10−7 (n = 11), ANGII 10−6 (n = 12), ANGII 10−5 (n = 12), ANGII 10−4 (n = 12), ZD-7155 (n = 12), and PD-123319 (n = 15). Furthermore, explants were treated with ANGII at 10−9 mol/L in the presence of ZD-7155 or PD-123319 at 10−5 mol/L, creating the additional groups: ANG 10−9 + ZD-7155 (n = 12) and ANG 10−9 + PD-123319 (n = 15). Cultures were photographed daily and branching morphogenesis was assessed according to Nogueira-Silva et al. (22). After 4 d in culture, lung explants treated with ANGII at 10−9 mol/L, ZD-7155 or PD-123319 were processed for western blot analysis of nonphosporylated and phosporylated forms of mitogen-activated protein kinases (MAPKs) [p44/42, p38, JNK (mAbs; Cell Signaling Technology, Danvers, MA, USA)] and phosphatidylinositol-3-kinase (PI3K/Akt) (Cell Signaling Technology) according to Nogueira-Silva et al. (22). For loading control, blots were probed with β-tubulin mAb (Abcam plc, Cambridge, UK) (n = 3). Quantitative analysis was performed with Quantity One 4.6.5 1-D Analysis Software (Bio-Rad Laboratories, Hercules, CA, USA). Pregnant rats, control or exposed to nitrofen, were anesthetized at 12.5 dpc with a mix of ketamine (75 mg/kg) and medetomidine (0.5 mg/kg) for subcutaneous implantation of an osmotic micropump filled either with saline or PD-123319 (randomly), on mid scapular region (Alzet osmotic pump Model 2ML1; Durect Corporation, Cupertino, CA, USA). Saline or PD-123319 solution was infused with a rate of 10 µL/h (20 mg/kg/d for PD-123319). For the reversal of the sedative effect, atipamezole (0.25 mg/kg) was used and butorfanole (1 mg/kg) was administered immediately after the surgery. Fetuses were assigned to six experimental groups: Control rats treated with saline (C + S); Control rats treated with PD-123319 (C + PD); Nitrofen rats treated with saline (N + S); Nitrofen rats treated with PD-123319 (N + PD); CDH rats treated with saline (CDH + S); and CDH rats treated with PD-123319 (CDH + PD). Pregnant rats were randomly assigned for cesarean section at 21.5 dpc or for spontaneous delivery at term. The pregnant rats killed at 21.5 dpc were laparotomized, and after longitudinal hysterotomy, each fetus (C + S, n = 14; C + PD, n = 15; N + S, n = 15; N + PD, n = 12; CDH + S, n = 15; CDH + PD, n = 24) was extracted, weighed and decapitated for organ harvesting (lungs, heart and kidneys). Organs were also weighed independently, organs-to-body weight ratios were assessed and lungs were either snap frozen in liquid nitrogen for biochemical analyses or fixed in 4% paraformaldehyde (PAF) for histological analyses. In this set of experiments, the level of lung hypoplasia was calculated according to Baptista et al. (9). The pups that were delivered spontaneously at term were placed immediately after birth in a light-heated box and randomly killed 5 min after birth or allowed to survive, without any care, support strategies or ventilatory support. Those killed by decapitation at min 5 (C + S, n = 15; C + PD, n = 9; N + S, n = 11; N + PD, n = 6; CDH + S, n = 12; CDH + PD, n = 14) were used for blood collection (neck bleeding) and gasometric evaluation (i-Stat1 analyser; Abbott, Chicago, IL, USA). These were then dissected for identification of CDH. Moreover, hearts were dissected for right ventricular hypertrophy evaluation and myocardial samples of right ventricular free wall were harvested and processed for q-PCR studies. The remaining fetuses were allowed to survive (C + S, n = 10; C + PD, n = 9; N + S, n = 14; N + PD, n = 21; CDH + S, n = 14; CDH + PD, n = 28), evaluated by two independent-blind observers (MJ Baptista and S Nunes) and scored at 1, 3, 5 and subsequently at each 5 min, using an APGAR-like score (Table 1, adapted from Dauger et al. ). The moment of death was registered and defined by the moment in which the two observers attributed an APGAR 0 (marked cyanosis, apnea, no spontaneous movements, no response to stimulus). All experiments were recorded in video to clarify any doubt. These pups were opened postmortem for diaphragm inspection. aThis score is obtained by assigning a value (0, 1 or 2) to 4 characteristics: skin color, breathing, spontaneous motor activity and reactivity to stimulus. The scores vary between 0 and 8. Lungs, heart and kidneys from all pregnant rats were weighed for maternal organ-to-body weight ratio analysis. Total lungs (left and right) were processed to determine protein and DNA contents. Protein content was assessed by Bradford method (24). DNA was extracted using the DNeasy Blood & Tissue Kit (Qiagen, Hilden, Germany). The trachea was cannulated and the lungs were fixed with PAF under a constant pressure of 20 cmH2O. Lungs were embedded in paraffin and sections were used to determine radial saccular count [RSC; using hematoxilin-eosin stain (H&E)], epithelial differentiation [IHC for clara cell secretory protein (CCSP) and prosurfactant protein C (SP-C) and determination of glycogen-content using periodic acid-Schiff stain (PAS)] and medial arterial thickness (using Weigert stain). RSC was estimated according to Emery and Mithal adapted method (25), at 100× magnification (Olympus BX61 microscope; Olympus, Tokyo, Japan), in 5 animals per group, 6 slides per animal (200 µm apart each other), and 10 segments per slide, by a blinded examiner (E Carvalho-Dias). Regarding epithelial differentiation, IHC was performed as previously described by Nogueira-Silva et al. (7), briefly described above. CCSP antibody [07-623; Upstate (Millipore), Billerica, MA, USA] was used in a 1:800 dilution and SP-C antibody (AB3428; Chemicon International, Temecula, CA, USA) in a 1:400 dilution. These slides and PAS stained slides were observed and photographed (Olympus BX61 microscope). The percentage of CCSP, SP-C and PAS stained cells per microscopic field was scored in a single-blinded fashion (100× and 400× magnification, respectively) in 6 independent peripheral and 4 central areas per section (6 slides per animal, 200 µm apart each other, and 5 animals per each experimental group). Scoring was as follows: 1, 0–20% cells/field; 2, 20–40% cells/field; 3, 40µ60% cells/field; 4, 60–80% cells/field; 5, 80–100%. Weigert resorcin fuchsin solution stains elastic fibbers, and it was used for morphometric assessment of pulmonary arteries (26). Pulmonary arteries were distinguished from pulmonary veins on the basis of the structure and position. Arteries that were approximately round [that is, the longest external diameter (ED, distance between the external elastic laminae), did not exceed the minimal ED by more than 50%] and had both clearly visible external and internal elastic laminae were analyzed. As the structural changes and pharmacological effects on pulmonary arteries might be vessel size dependent, we selected for further analysis arteries subcategorized into 3 sizes: ED less than 30 µm, ED 30 µm to 50 µm, and ED greater than 50 µm. Then, using AxionVision Rel. 4.3 (Carl Zeiss, Göttingen, Germany), internal area (IA, defined by internal elastic lamina), external area (EA, defined by external elastic lamina) and total area (TA, defined by edge of the vascular sheath) were measured. The percentage of medial (MA) and adventitial arterial area (AA) were calculated according to the following formulas: MA (%) = [(EA − IA)/EA] × 100; AA (%) = [(TA − EA)/EA] × 100. At least 10 arteries for each section were evaluated, 6 sections per animal (200 µm apart each other), and 3 animals per each experimental group (at 400× magnification). Hearts (C + S, n = 8; CDH + S, n = 6; CDH + PD, n = 8) were used for right ventricle (RV) and left ventricle (LV) dissection (LV contains septum). RV and LV were weighed separately. The ratio RV/LV was determined and used as an index of right ventricular hypertrophy. Other hearts (C + S, n = 7; CDH + S, n = 6; CDH + PD, n = 6) were dissected, transversally cut and orientated according to short-axis view of the heart, before fixed in PAF and embedded in paraffin. Four micrometer sections were stained with H&E and photographed at 40× magnification (Olympus BX61 microscope). The right ventricular wall thickness was determined in the short-axis view of the heart, in the maximum distance between the right side of the interventricular septum to the right ventricular free wall, using AxionVision Rel. 4.3 (Carl Zeiss) (5 measurements per animal, 20 µm apart each other). Right ventricular mRNA expression of angiotensinogen, B-type natriuretic peptide (BNP) and endothelin-1 (ET-1), genes previously defined as ventricular overload markers, was evaluated according to Baptista et al. (27). Data are presented as mean ± SEM. Statistical analysis was performed using the statistical software SigmaStat (version 3.5; Systat Software Inc., Chicago, IL, USA). Multiple group comparisons were made by analysis of variance. For morphometric explants studies, Western blot analysis, biochemical studies, histological studies, right ventricular hypertrophy evaluation and q-PCR studies, one-way ANOVA on ranks was used. Two-way ANOVA on ranks was used for organ-to-body weight ratio analysis and gasometric studies. Student-NewmanKeuls test was used for posttest analysis. Statistical significance was confirmed at P < 0.05. The IHC studies revealed that all RAS components, renin, ACE, angiotensinogen, AT1 and AT2 receptors, were expressed throughout all studied gestational ages in the fetal lung (Figure 1). Protein expression pattern of RAS components during fetal lung development (from 15.5 until 21.5 dpc). (A) Renin was predominantly expressed in epithelium. (B) ACE expression. (C) Angiotensinogen expression in epithelial, endothelial (arrow) and vascular smooth muscle cells (arrowhead). (D) AT1 receptor immunostaining. (E) AT2 receptor immunostaining. Original magnification 200×. Renin was expressed in bronchiolar and also in alveolar epithelium throughout gestation (Figure 1) since 13.5 dpc and appears to be maximal in the most immature buds (see Supplemental Figures 1A–D). Endothelial ACE expression started in larger proximal vessels, early in the gestation, and spreads distally to involve progressively smaller vessels (Figure 1B). Interestingly, ACE protein was also detectable in epithelial cells since 13.5 dpc (see Supplemental Figure 1E). Regarding angiotensinogen, protein expression was clearly observed in epithelial cells since 15.5 dpc (Figure 1C). Mesenchymal tissue also displayed scattered angiotensinogen positive cells, first in endothelial cells and in the later gestational ages (19.5 and 21.5 dpc) clearly in vascular smooth muscle cells (Figure 1C). AT1 receptor protein was first mainly expressed by undifferentiated mesenchyme at 15.5 dpc and, throughout the gestation, it was predominantly expressed by vascular smooth muscle cells and scattered in the mesenchyme (Figure 1D). AT2 receptor was expressed in bronchial epithelial cells and since 19.5 dpc muscle cells of large blood vessels also expressed it (Figure 1E). Moreover, the epithelial AT2 expression was also demonstrated at 13.5 dpc (see Supplemental Figure 1F). The presence of renin, ACE, angiotensinogen and AT1 and AT2 protein on lung during fetal development prompted us to evaluate the role of ANGII, the physiologically active peptide of RAS, on lung morphogenesis. For this purpose, fetal lung explants were treated with increasing concentrations of recombinant ANGII (Figure 2A). 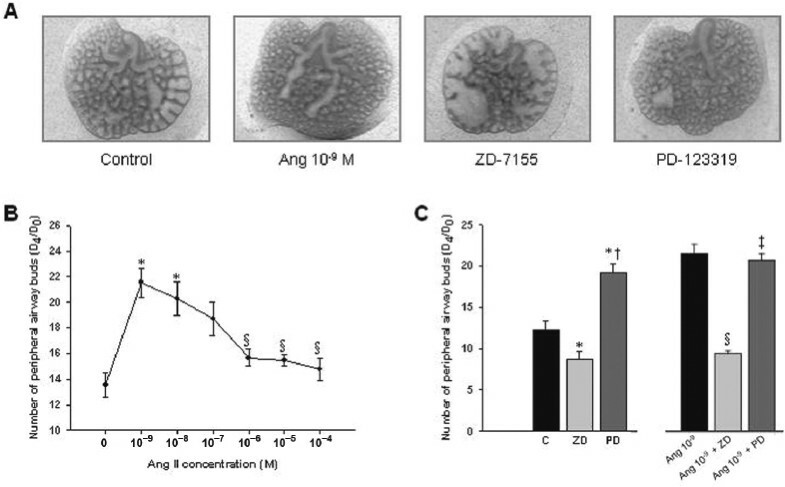 ANGII significantly increased the number of peripheral airway buds, mainly with concentration of 10−9 mol/L, the minimal concentration studied (Figure 2). On the other hand, treatment of lung explants with an AT1-antagonist (ZD-7155) significantly inhibited, whereas AT2-antagonist (PD-123319) treatment significantly enhanced lung branching in a similar way to the dose of ANGII-inducing maximal effect (Figure 2C). Moreover, the stimulatory effect on lung branching induced by ANGII 10−9 mol/L was completely abolished by AT1-antagonist treatment, and the simultaneous lung treatment with ANG 10−9 mol/L and PD-123319 did not accomplish additional stimulatory effect on explants growth when compared with ANG 10−9 mol/L treatment (Figure 2C). Thus, these results demonstrated that ANGII had a stimulatory effect on lung branching, mediated by AT1 receptor. Interestingly, this stimulatory effect was mimicked by treatment with AT2-antagonist alone. Branching morphogenesis in a rat lung explant system. (A) Representative examples of control and fetal lung explants treated with ANGII at 10−9 mol/L, ZD-7155 (an AT1-antagonist) or PD-123319 (an AT2-antagonist). Original magnification 25×. (B) Number of total airway buds of lung explants treated with increasing ANGII concentrations or (C) with ZD-7155 (ZD), PD-123319 (PD), ANG 10−9 + ZD or ANG 10−9 + PD. Results are expressed as ratio of d 4 (D4) and d 0 (D0) of culture (D4/D0 ratio). P < 0.05: *Versus ANGII at 0 mol/L (control, C), §Versus ANGII at 10−9 mol/L, †Versus ZD-7155 at 10−5 mol/L, ‡Versus ANG 10−9 + ZD. To clarify the intracellular signaling pathways that mediate ANGII actions on lung growth, lung explants treated with ANGII at 10−9 mol/L (selected due to its maximal effect in explant growth), ZD-7155 or PD-123319 were evaluated for MAPK and Akt pathways activation (Figure 3A). AT1 receptor blockage induced a significant decrease of p-38 and JNK phosphorylation when compared with control explants (Figures 3B, D, respectively). On the other hand, the increase on lung branching, induced by ANGII at 10−9 mol/L and AT2 receptor antagonist, significantly stimulated p44/42 and Akt phosphorylation (Figures 3C, E, respectively). MAPK and Akt kinase activities in control (C) lung explants and treated with ANGII at 10−9 mol/L (Ang 10−9), ZD-7155 (ZD) or PD-123319 (PD). 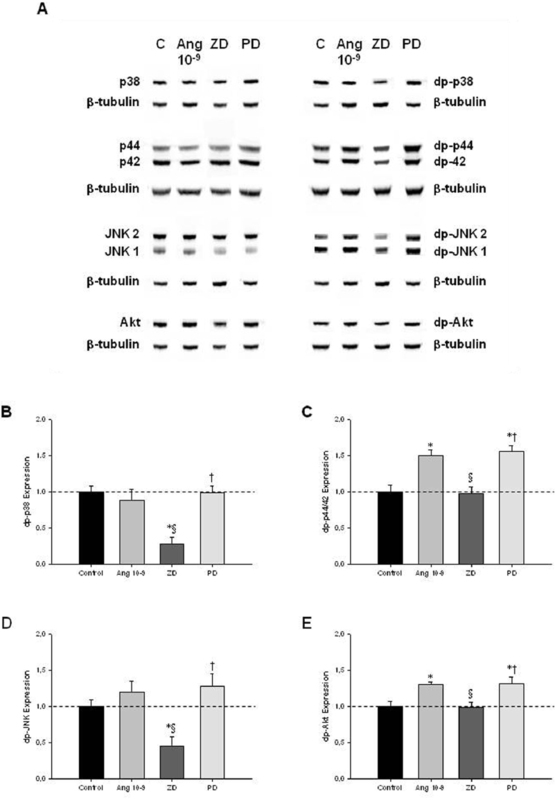 (A) Western blot analysis of p38, p44/42, JNK1/2 and Akt and to diphosphorylated forms of p38 (dp-p38), p44/42 (dp-p44/42), SAPK/JNK (dp-JNK1/2) and Akt (dp-Akt). Control loading was performed using β-tubulin (55 kDa). p38 corresponds to 38 kDa. p44/42 correspond to 44 and 42 kDa, respectively. JNK1 and 2 correspond to 46 and 54 kDa, respectively. Akt corresponds to 56 kDa. Semiquantitative analysis for dp-p38 (B), dp-p44/42 (C), dp-JNK1/2 (D), and dp-Akt (E). Results are presented as arbitrary units normalized for β-tubulin. P < 0.05: *versus ANGII at 0 mol/L (control, C), §versus ANGII at 10−9 mol/L, †versus ZD-7155 at 10−5 mol/L. 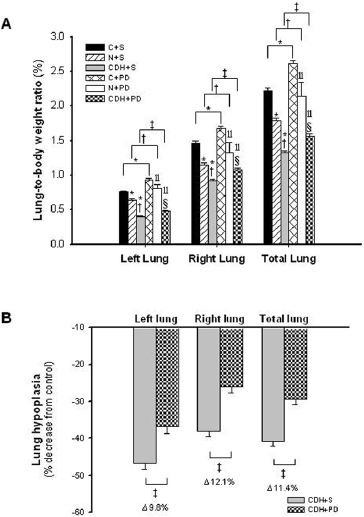 Left, right and total lung-to-body weight ratio (LW/BW) were analyzed for different experimental groups. According to the nitrofen-induced CDH experimental model, pups of nitrofentreated dams presented left and right lung hypoplasia, which was maximal in CDH + S group. Maternal PD-123319 treatment induced significant growth of both left and right lungs in control, nitrofen and CDH groups. In fact, LW/BW was significantly higher in the control, nitrofen and also CDH rats treated with PD-123319 when compared with the respective saline-treated groups (Figure 4A). Indeed, PD-123319 treatment stimulated partial recovery of lung hypoplasia in CDH neonates, inducing an increase of 11.4% in total lung weight (Figure 4B). Considering these results and to assess the potential of PD-123319 as a useful treatment for severe lung hypoplasia associated with CDH, we pursued our study focused in comparing C + S, CDH + S and CDH + PD groups. In vivo antenatal PD-123319 treatment effects on lung growth. (A) Ratio of left, right and total lung-to-body weight in control (C), nitrofen (N) and CDH groups treated with saline (C + S, N + S, CDH + S) or PD-123319 (C + PD, N + PD, CDH + PD). Antenatal administration of PD-123319 enhanced lung growth in all studied groups. (B) Effect of PD-123319 treatment on left, right and total lung hypoplasia. Prenatal administration of PD-123319 ameliorated both left and right lung hypoplasia. Results are expressed as %. P < 0.001: *versus C + S, †versus N + S, ‡versus CDH + S, ‖versus C + PD, §versus N + PD. For left lung, there is a statistically significant interaction between variables: disease-treatment (P = 0.009). Biochemical analysis of lung protein and DNA content demonstrated that there was no significant difference in the protein/DNA ratio between C + S, CDH + S and CDH + PD groups (C + S 0.024 ± 0.005; CDH + S 0.030 ± 0.004; CDH + PD 0.026 ± 0.002). The histological analysis of lung architecture showed that CDH + S lungs appeared to have a thickened septal and saccular walls and an increased amount of interstitial tissue when compared with C + S. However, CDH + PD had a significantly greater development of saccules and airspaces when compared with CDH + S lungs (Figure 5A). In fact, RSC of CDH + S pups was significantly lower when compared with C + S group (Figure 5B). However, PD-123319 treatment induced a significant increase on RSC of CDH pups, that is, promoted distal lung development (Figure 5B). Antenatal PD-123319 treatment increased RSC. (A) Representative H&E stained sections of C + S, CDH + S and CDH + PD lungs, used to RSC analyzes. Note greater saccular development and increase of lung aeration in CDH + PD compared with CDH + S. Original magnification 100×. (B) Mean radial saccular count in C + S, CDH + S and CDH + PD groups. PD-123319 treatment induced increase of RSC in CDH pups. P < 0.001: *versus C + S, ‡versus CDH + S.
Regarding epithelial differentiation and lung maturity, CCSP (proximal epithelial cell differentiation marker), SP-C (distal epithelial cell differentiation marker) and PAS+ glycogen stores (an indirect signal of immaturity) were evaluated (Figure 6). No significant differences in score of CCSP (Figure 6A), SP-C (Figure 6B) and PAS-stained cells (Figure 6C) between C + S and CDH groups were observed. Antenatal PD-123319 treatment did not interfere with epithelial differentiation and lung maturation. (A) Representative CCSP-stained sections of C + S, CDH + S and CDH + PD lungs. Original magnification 100×. (B) Score of CCSP-stained cells in C + S, CDH + S and CDH + PD groups. (C) Representative SP-C stained sections in different groups. Original magnification 200×. (D) Score of SP-C-stained cells. (E) Representative PAS stained sections of C + S, CDH + S and CDH + PD lungs. Original magnification 400×. Arrows: PAS+ (glycogen-rich) cells. (F) Score of PAS-stained cells. No significant difference between experimental groups was observed in CCSP, SP-C and PAS. Concerning other organs than lungs, nitrofen treatment (nitrofen and CDH groups) induced decrease of heart-to-body weight (HW/BW) and kidney-to-body weight (KW/BW) ratios. However, antenatal PD-123319 treatment did not significantly change either HW/BW or KW/BW (see Supplemental Figure 2). MA percentage was significantly increased in all arteries (independently of its size) in CDH + S group when compared with C + S and CDH + PD groups (Figure 7). CDH + PD neonates presented a significant decrease in MA percentage when compared with CDH + S for all arterial sizes, with maximal effect on smaller arteries. The effect was so evident that CDH + PD arteries had no significant difference in MA percentage when compared with C + S group (Figure 7B). Regarding adventitial layer, saline or PD-treated CDH groups presented a significant increase in AA percentage when compared with C + S for all arterial sizes (Figure 7C). Thus, PD-123319 treatment induced decrease of MA percentage and did not induce any change on AA percentage. Indirect pulmonary hypertension assessment. (A) In upper panel are presented representative examples of pulmonary arteries > 50 µm stained with Weigert resorcin fuchsin solution of C + S, CDH + S and CDH + PD groups; in lower panel, representative examples of small pulmonary vessels (<30 µm) for each group are presented. Original magnification 400×. (B) Percentage medial area of pulmonary arteries of different external diameters. (C) Percentage adventitial area of pulmonary arteries of different external diameters. (D) Right ventricular levels of angiotensinogen, BNP and ET-1 mRNA in C + S, CDH + S and CDH + PD neonates, expressed in arbitrary units normalized for β-actin. PD-123319 treatment significantly decreased arterial medial area and these overload markers on CDH pups. P < 0.001: *Versus C + S, ‡versus CDH + S. ■, C + S; Open image in new window , CDH + S; Open image in new window , CDH + PD. Regarding right ventricular hypertrophy index and right ventricle thickness, markers of right ventricular hypertrophy secondary to chronic PH, CDH neonates did not present differences when compared with control group. Moreover, PD-123319 treatment did not change these parameters (Table 2). C, control; CDH, congenital diaphragmatic hernia; PD, PD-123319; S, saline. aValues represent the mean ± SEM of measurements. P < .05: No significant difference between experimental groups was observed. Additionally, expression levels of right ventricular molecular markers of PH (angiotensinogen, BNP and ET-1) were assessed in pups allowed to be delivered at 5 min after birth. In Figure 7D, mRNA levels of these markers normalized to β-actin are shown. CDH + S group presented a significant increase of angiotensinogen and an increase (although not statistical significant) of BNP and ET-1 compared with C + S group. On its turn, PD-123319 treatment significantly decreased these overload markers on CDH pups. The adaptation of fetuses to extrauterine life was monitored within the first 5 min after delivery by determining an APGAR-like score (0–8). CDH + S neonates presented an APGAR score of 2.35 ± 0.17, 1.82 ± 0.12 and 2.28 ± 0.18, at 1, 3 and 5 min after birth, respectively. On the other hand, antenatal PD-123319 treatment improved APGAR score to 3.23 ± 0.26, 2.97 ± 0.09 and 2.71 ± 0.13, at 1, 3 and 5 min after birth (P < 0.05), respectively. Five minutes after birth, a moment in which all neonates were alive, neonates of C + S, N + S, CDH + S, N + PD and CDH + PD groups were used for blood collection (collected after decapitation) and gasometric evaluation. When compared with control pups, neonates of nitrofen-treated dams (N + S and CDH + S) presented significant acidosis, decrease of PO2 and SatO2, and increase of PCO2 and lactate, which was maximal in CDH + S neonates (pups with maximal degree of lung hypoplasia) (Table 3). On its turn, antenatal PD-123319 treatment allowed a statistical significant increase of pH, PO2 and SatO2, and decrease of PCO2 and lactate concentration. Indeed, there was no difference in gasometric parameters between control, nitrofen, and CDH groups treated with PD-123319 (Table 3). C, control; CDH, congenital diaphragmatic hernia; N, nitrofen; PD, PD-123319; PCO2,CO2 partial pressure; PO2, O2 partial pressure; S, saline; SatO2, O2 saturation. aValues represent the mean ± SEM of measurements. bP < 0.05 versus C + S; cversus N + S; dversus CDH + S; eversus N + PD. There is a statistically significant interaction between variables: disease-treatment for pH, PCO2, PO2 and SatO2. Concerning neonatal survival, the average survival time was significantly longer in PD-123319-treated pups than in CDH + S pups (30.3 ± 3.2 min for CDH + S versus 42.4 ± 1.3 min for CDH + PD, P < 0.001). As a result, all CDH + PD pups, but only 57% of the CDH + S pups, survived for up to 30 min. At 45 min after birth, only 7% of CDH + S pups were alive, as opposed to over a third of CDH + PD pups. In fact, PD-123319 treatment increased survival rates of CDH neonates for all time points evaluated (Figure 8). Survival analysis. (A) Representative examples of cyanotic color of CDH + S versus pink coloration of CDH + PD neonates at 5 min of life. (B) Survival rates (expressed as percentage of pups surviving at each 5 min) of CDH + S and CDH + PD neonates. Antenatal PD-123319 treatment improved survival time in CDH pups (mean survival time: CDH + S 30.3 ± 3.2 min; CDH + PD 42.4 ± 1.3 min, P< 0.001). Open image in new window , CDH + S; Open image in new window , CDH + PD. Regarding potential secondary effects of PD-123319 on maternal organs, their lungs, heart and kidneys were weighed. PD-123319 treatment did not significantly change maternal HW/BW, KW/BW or LW/BW ratios (see Supplemental Figure 3). This study demonstrated that all components of RAS (renin, ACE, angiotensinogen, AT1 and AT2 receptors) were constitutively expressed in the lung during all studied gestational ages and that ANGII had a stimulatory effect on lung branching, mediated by AT1 receptor, through p44/42 and Akt phosphorylation. This stimulatory effect on lung growth was mimicked by treatment with AT2-antagonist. Therefore, AT2 receptor antagonist was evaluated as a putative antenatal treatment for diseases characterized by fetal lung hypoplasia such as CDH. 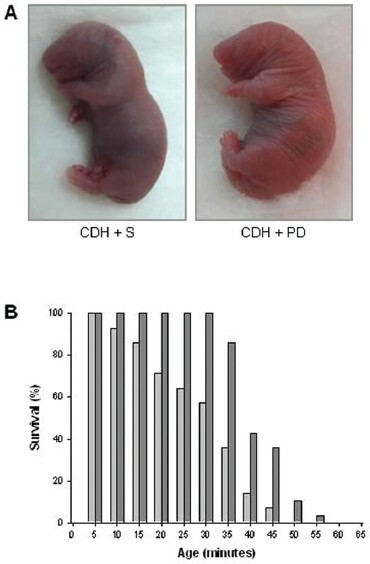 In an animal model of CDH, antenatal PD-123319 treatment increased neonatal lung growth, ameliorated indirect parameters of PH, improved lung function and survival, without maternal or fetal deleterious effects. In past years, it has been demonstrated that local ANGII formation and its tissue-specific effects on growth and differentiation are thought to be extremely important for embryonic and fetal development (12). Regarding fetal lung, this study corroborated previous evidences concerning ACE, AT1 and AT2 expression (13, 14, 15,28). For the first time, the present study showed that renin and angiotensinogen are also expressed during lung development. Interestingly, renin, ACE and AT2 were expressed at very early stages (since 13.5 dpc), suggesting an important role for a local RAS since early stages of lung development. The results of RAS components expression prompted us to hypothesize that a local RAS is active in the developing lung. Therefore, the role of ANGII on lung morphogenesis was evaluated. ANGII supplementation induced an increase in lung explants growth, and it is necessary to stress that this enhancing effect of ANGII on number of peripheral airways buds of lung reached about 37%, whereas the stimulatory effect induced by fibroblast growth factor-10 (FGF-10), a classical and very important lung growth factor, in a similar model of murine lung explants, was around 20% (29). The possible mechanism by which RAS interferes with the airway branching or pulmonary vascular development is still unclear, and further investigation is required. However, it was already substantially demonstrated that reciprocal interactions between airways and blood vessels are critical for normal lung development. For instance, it was demonstrated that ablation of lung epithelium impair lung vascular cells development (30). Moreover, VEGF inhibition in neonatal rats leads to arrested alveolar development, suggesting that inhibition of vascular growth itself may directly impair lung development (31, 32, 33). Thus, given that, in the present study, it was demonstrated that some components of RAS are expressed on epithelium and others on mesenchyme/vascular cells, it is possible that RAS is involved in both processes: airway and vasculature branching. Interestingly, AT1 receptor inhibitor decreased, whereas AT2-antagonist significantly increased lung growth in explants. This opposite effect of AT1 and AT2 receptors, namely a stimulatory effect of AT1 and inhibitory effect of AT2, is also described on other tissues (34, 35, 36, 37, 38, 39). Many of the effectors that modulate fetal lung branching seem to activate MAPK and/or PI3K/Akt cascades (40). Thus, MAPK and PI3K/Akt pathway activation by ANGII and AT1 and AT2 antagonists in fetal lung development was investigated. ANGII and AT2 receptor antagonist treatment induced an increase in lung branching by the stimulation of p44/42 and Akt phosphorylation. These intracellular mediators are also involved in AT1 effects on proliferation and survival of cells in other tissues (34,36). Regarding lung growth inhibition induced by AT1 antagonist, it was mediated by a decrease of p-38 and JNK phosphorylation. These MAPK families were already demonstrated to be involved on induction of lung branching (22). The in vitro studies demonstrated that a local RAS is functional at early stages of lung morphogenesis. 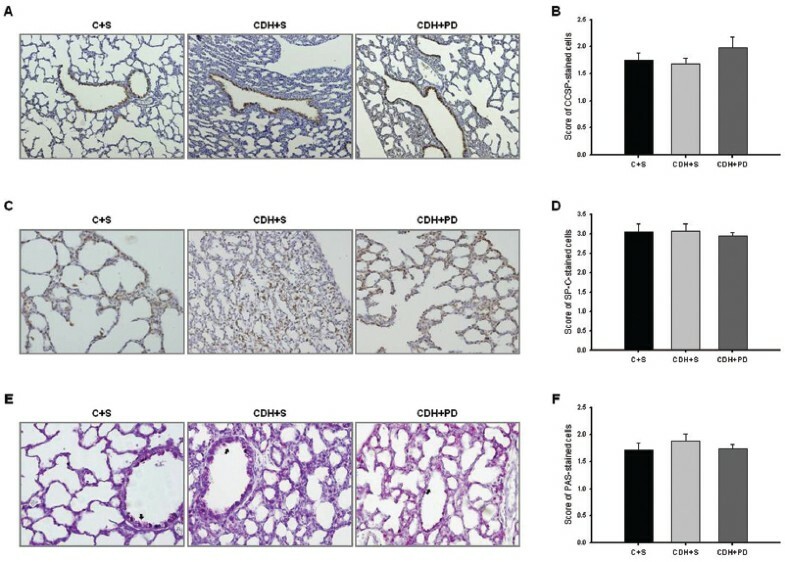 Moreover, the significant stimulatory effect on lung growth mediated by AT2 receptor antagonist led us to hypothesize that AT2 could be a new target for treatment of diseases characterized by fetal lung hypoplasia, such as CDH. In fact, AT2 receptor is described to be expressed virtually only during fetal life (11,12,41), which would annul potential maternal adverse effects. Thus, treatment with AT2 antagonist (PD-123319) was selected for the in vivo study, in which the nitrofen-induced CDH rat model (19,42) was used. The gestational age selected for maternal PD-123319 administration was based on the effect observed on lung explants that were harvested at 13.5 dpc. 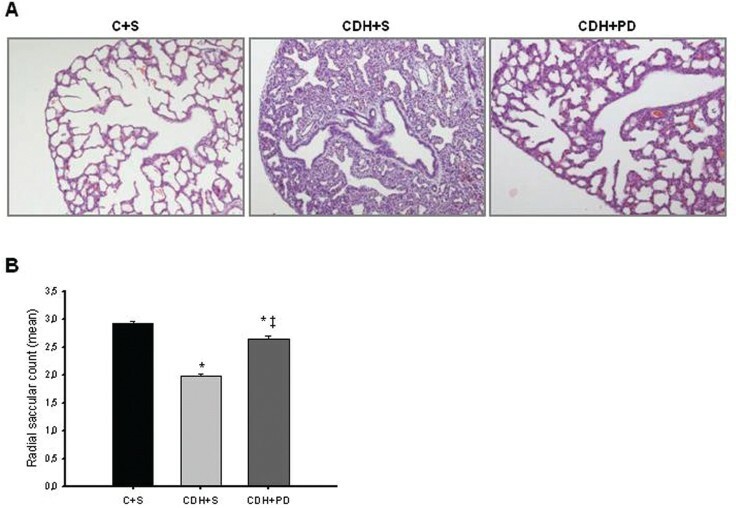 The nitrofen-induced CDH model is an experimental model of severe lung hypoplasia, which reasonably replicates the major abnormalities and the pathophysiology described in human CDH (42, 43, 44). Although the mechanism by which nitrofen induces the diaphragmatic defect and lung hypoplasia is not fully understood, recent evidences suggest the involvement of abnormalities linked with the retinoid signaling pathway in this model and also in human CDH etiology (42, 43, 44, 45). Indeed, one clinical study demonstrated the presence of decreased levels of retinol and retinol-binding protein in human CDH, suggesting a possible deterioration of retinol transport across the placenta (46). Regarding the nitrofen-induced CDH model, it was already demonstrated that nitrofen inhibits retinal dehydrogenase 2 (RALDH2), a key enzyme responsible for the conversion of retinal to retinoic acid (47). Moreover, the co-administration of retinoids (Vitamin A or retinoic acid) in nitrofen-induced CDH induces lung growth and reduces the incidence of CDH (9,10,48). Interestingly, some studies have described an inhibitory interaction between retinoid acid pathway and RAS, namely in adult cardiac remodeling (49,50). Thus, a possible interaction between retinoid acid pathway and RAS might be present during lung morphogenesis, but the underlying mechanisms remain unclear and further investigation is required. Maternal PD-123319 subcutaneous administration significantly increased lung growth in control, nitrofen and CDH groups. In fact, in CDH neonates, despite the presence of mechanical forces that compress lungs, PD-123319 induced partial recovery of lung hypoplasia as assessed by LW/BW (an increase of 11.4%). In face of these results and to assess if the treated-lung is structural and functionally ameliorated, we focused further studies in comparing C + S, CDH + S and CDH + PD groups. In human and experimental CDH there is a reduction in peripheral lung development (1,10). PD-123319 treatment stimulated lung growth by promoting distal lung development as measured by the enhanced RSC. The potential clinical relevance of this effect should be emphasized, since such an increase in lung parenchyma can be determinant in providing a better adaptation of CDH fetus to extrauterine life. Regarding epithelial differentiation and lung maturity, CCSP (a Clara cells marker, marker for proximal lung), SP-C (a type II pneumocytes marker, marker for distal lung) and PAS glycogen stores (a signal of immaturity) were assessed. No differences between groups were detected in CCSP, SP-C and PAS-stained cells score. 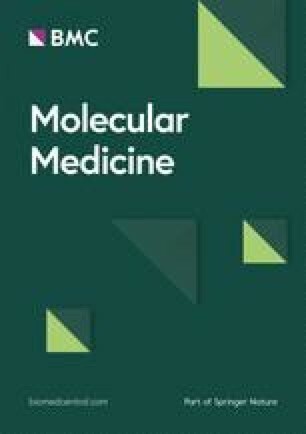 Contradictory results about lung maturity and surfactant status in CDH animal models have been published, with studies demonstrating that the CDH lung is surfactant deficient (51, 52, 53) and others indicating no change in alveolar surfactant composition, unchanged or even increased surfactant protein expression (54, 55, 56, 57). However, one of the most recent studies performed with human CDH fetuses demonstrated that surfactant maturation is not delayed (54). The present study corroborates the idea that CDH does not appear to interfere or delay epithelial differentiation and surfactant accumulation (54). Moreover, PD-123319 treatment did not impair fetal lung maturation in CDH neonates. Persistent PH accounts for significant mortality and morbidity in CDH (1,2,58). 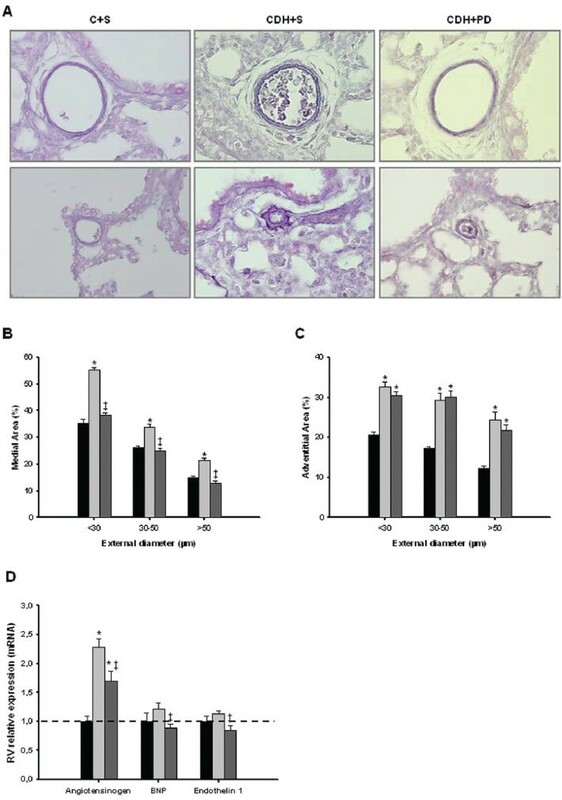 In severe human CDH and also in nitrofen-induced model of CDH, it was already demonstrated that PH results from decreased number of arteries, increased thickness of media and adventitia of pulmonary arterial walls and distal muscular extension to the non-muscular intraacinar arteries (58,59). In this study, the effect of PD-123319 treatment on PH was indirectly assessed by morphometric pulmonary vascular analysis (59) and its cardiac repercussion by determination of right ventricular hypertrophy index and right ventricle thickness, and quantification of right ventricular overload molecular markers (Angiotensinogen, BNP and ET-1) (27). To better analyze the vessel morphology, areas were measured instead of thickness since this approach avoids the bias introduced by irregular shape of elastic laminae. Thus, PD-123319 treatment induced decrease of MA percentage for all arterial sizes, with maximal effect on smaller arteries. Moreover, CDH + S neonates did not present differences in right ventricular hypertrophy index and right ventricular wall thickness (morphological markers) when compared with C + S group, but they presented an increase of molecular markers of right ventricular overload. Thus, 5 min after birth, CDH + S neonates only presented molecular changes secondary to PH, but not yet morphological alterations (secondary to chronic PH). PD-123319-treated CDH pups presented a significantly decrease of right ventricular overload molecular markers and did not influence morphological markers. Therefore, PD-123319 maternal administration partially reversed pulmonary arterial structural abnormality that characterizes CDH and decreased molecular markers of PH, which suggest that PD-123319 might reduce pulmonary vascular reactivity, and the risk of postnatal persistent PH observed in CDH neonates. Regarding other antenatal pharmacological strategies to decrease PH in CDH, Luong et al. demonstrated recently that antenatal sildenafil treatment (from 11.5 to 20.5 dpc, daily subcutaneous injection) attenuates PH in experimental CDH (3). In fact, that study demonstrated that antenatal sildenafil treatment improved lung structure, increased pulmonary vessel density and reduced right ventricular hypertrophy in CDH (3). However, in opposition to PD-123319 treatment, sildenafil had not promoted lung growth, as demonstrated by LW/BW, and consequently it did not induce a recover of lung hypoplasia (3). Moreover, it is necessary to stress that the idea that there is PH in CDH, since fetal period, is underlying to Luong’s study (3). Nonetheless, it was already demonstrated that there is vascular hypoplasia in nitrofen-induced CDH and neonatal PH, but it is not yet proven the presence of PH in CDH fetus (27,58,59). Indeed, immediately after the birth, Luong et al. demonstrated the presence of right ventricular hypertrophy (an indirect signal of PH) in CDH neonates (3). In the present study, CDH neonates at 5 min after the birth did not present increase of right ventricular hypertrophy index or right ventricle thickness. However, CDH + S neonates presented an increase of right ventricular overload markers which reveals a molecular cardiac repercussion. According to the literature, it was already demonstrated that CDH vascular pulmonary alterations only affect neonatal and not fetal hemodynamics. Baptista et al. demonstrated that CDH is associated with significant molecular alterations secondary to PH, but only in the right ventricle and after birth (27). Moreover, also in fetal lamb CDH model, it was demonstrated that newborn CDH lambs had no differences in right ventricular weight or right ventricular wall thicknesses compared with control lambs (60). Thus, despite the occurrence of pulmonary vascular modifications from early stages of prenatal development, the present study also shows that PH is only present after birth, likely occurring secondary to vascular hypoplasia that characterizes CDH, and also consequently to pulmonary vasoconstriction, which is secondary to alveolar hypoplasia, hypoxia and acidosis. So, antenatal PD-123319 treatment interfered and improved the key determinants of mortality associated with CDH, namely lung hypoplasia and PH. Furthermore, maternal PD-123319 administration improved lung function, namely pulmonary gas exchange, as demonstrated by APGAR score, gasometric and survival evaluation. Regarding gasometry it is necessary to stress that due to low fetal blood volume, all blood possibly collected by decapitation was used for gasometric evaluation. So, gasometry evaluated a mix of arterial and venous blood. Nonetheless, antenatal PD-123319 treatment allowed a statistical significant improvement of acidosis, hypercapnia, hypoxia and lactate concentration that characterizes CDH fetuses. The results of these direct indicators of ventilation/perfusion matching quality suggest an obvious improvement of pulmonary gas exchange and peripheral O2 delivery. Furthermore, this enhancement on lung function had important consequences on neonatal survival, namely PD-123319 treatment induced significantly longer average survival time. However, it is necessary to stress that the survival evaluation was performed without neonatal care or ventilatory support. This fact might be the explanation for the death of all neonates, despite the increase on lung function and survival time induced by antenatal PD-123319 treatment. Regarding potential fetal adverse effects, the nitrofen-exposed pups presented decrease of HW/BW and KW/BW ratios as previously documented (10,61, 62, 63). On the other hand, PD-123319 beneficial effect seemed lung-specific, since HW/BW and KW/BW ratios of the pups were not altered. Concerning potential maternal secondary effects induced by PD-123319, no differences on heart, kidneys and lungs were observed. The absence of maternal deleterious effects could be due to the fact of AT2 receptor expression is dramatically decreased after birth, being restricted to a few organs (11,12,41). Indeed, an increase of AT2 receptor expression during adult life has been only observed under pathological conditions (41). In conclusion, this study demonstrated the existence of a functional local RAS in fetal lung. Moreover, it establishes AT2 receptor antagonist (PD-123319) as a putative antenatal therapy for pathologies characterized by fetal lung hypoplasia, such as CDH. This project was funded by Fundação para a Ciência e a Tecnologia (PTDC/SAU-OBD/108051/2008) and by Secção de Neonatologia da Sociedade Portuguesa de Pediatria (Grant ZERU 2008). P Piairo was supported by Fundação para a Ciência e a Tecnologia (reference SFRH/BD/33410/2008). RS Moura was supported by Fundação para a Ciência e a Tecnologia (reference SFRH/BPD/15408/2005). PD-123319 was kindly supplied by Medical Division of Pfizer Inc, Groton, Connecticut, USA. We would like to thank to Luís Martins for histological technical support and help on animal euthanasia and to Nuno M Pires for Weigert staining and vascular morphometric analysis support. Supplementary material, approximately 1157 KB.